Unlike many of Tribeca's muscular Romanesque Revival loft buildings, No. 57 Laight St. is light and graceful. In 1828 R. Pattison lived in the brick-faced home at No. 57 Laight Street. Its 25-foot width suggests that it was on par with the Federal-style mansions that ringed St. John's Park, just a block away. Despite the apparent upscale tone of the house itself, Pattison's rear yard privy was deemed "a nuisance" by the Common Council on December 29 that year. Change in the neighborhood came quickly. The house was being operated as a boarding house in the 1830s, run by the widow Hannah Vanriper. In 1846 the ground floor had been converted for business and Henry Hollsberg and his family lived above his grocery store. By 1860 the Helms family owned the building, and the grocery store was run by brothers Dederick and Frederick. The Helms family held title to the building as late as 1875. What had been a neighborhood of wealth and refinement was now one of warehouses and commerce. St. John's Park was demolished for the Hudson River Railroad's private freight terminal. The roomers in No. 57 Laight Street were common laborers. Among them in 1880 was the family of 11-year old Edward Radcliffe. Edward was a problem for his parents. The New York Times described him as "a wayward boy." He ran away from home the first week of May that year, and "was reclaimed by his father at Police Headquarters." Two weeks later, on May 25, Edward was "lounging in the express office" at No. 401 Washington Street where the Custom House broker gave him whiskey. His father found him drunk in a Washington Street stable. He took him home, gave him supper and the family all went to bed at around 8:00. Although Radcliffe checked on his son at around 2:00 a.m., the boy attempted another escape soon afterward. He tried to slip out through the window with fatal results. His "mutilated" body was found in the rear yard by a milkman at around 4:00. By the time of the tragedy the old building sat on valuable real estate. In 1892 architects Horgan & Slattery, acting as their own developers, demolished it and commenced construction on a modern loft building. Their Renaissance Revival-style factory and store, completed the following year, was especially pleasing. What little dimension there was on the flat-faced facade was created by slightly recessing the three-story arcades of the Collister Street elevation. Even the sills and lintels were flush with the brick. Instead of overt decoration, Horgan & Slattery used materials to make the structure stand out. Variegated orange-hued ironspot Roman brick gave life and movement to the facade. Bullnose bricks rounded and softened the corners. Thin brick voussoirs created dramatic sunburst-like effects over the arched openings. Rounded corners, variegated brick and visually-powerful voussoirs eliminated the need for conspicuous decoration. Rather surprisingly in a neighborhood of freight warehouses and produce concerns, No. 57 Laight Street filled with glass and mirror dealers. In 1898 its tenant list included Schrenk & Co., "looking glass;" John Proessl, who also dealt in looking glasses; the United Bavarian Looking Glass Works; and Tritschler, Winterhalder & Co., "druggists' glassware." Their landlord was Anna Woerishoffer, whose husband, well-known stock broker Charles F. Woerishoffer, had died in 1886. His estate was valued at upwards to $4 million--a significant $105 million today. Anna generously used her wealth for public good. In January 1910, for instance, she donated $100,000 to the German Hospital and Dispensary, and on October 24, 1911 was recognized by the Prussian Government for her "distinguished services in the field of social betterment." She nevertheless retained possession of No. 57 Laight Street until 1912, when she sold it to the Denver Chemical Manufacturing Company. A tragic side note was that, despite Anna Woerishoffer's selfless philanthropies and social work, she became a victim of the anti-German sentiment that swept America during World War I. On March 20, 1918, according to Internal Revenue Service documents, she was "held to be a German subject, and an alien enemy." The Denver Chemical Manufacturing Company spent $750 in 1913 on what alteration plans described as "fireproofing." Despite its name, the firm was founded and based in New York City. It made one item, a cream marketed as Antiphlogistine, which it introduced in 1893. 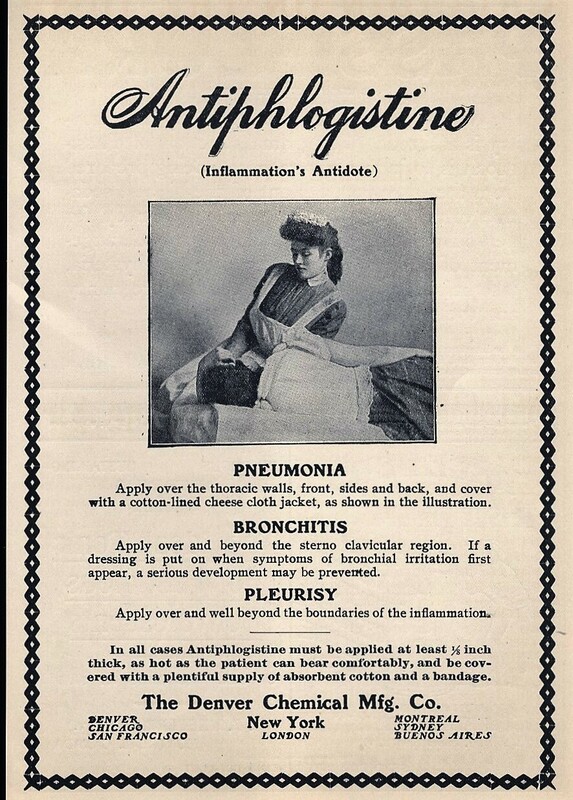 The original trademark application for Antiphlogistine described it as "possessing curative properties and being a curative remedy for injuries and acute and chronic inflammatory affections." 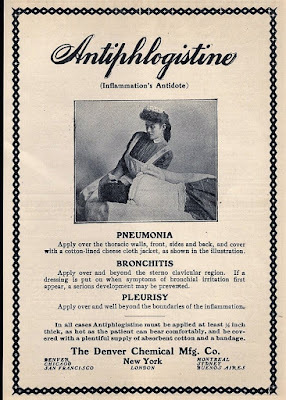 By the time Denver Chemical Manufacturing Company moved into the Laight Street building, the cream was being marketed as an "instantaneous cure" for almost anything, including "inflamed breasts, orchitis, boils, sprains, felons, periostitis, chronic ulcers, and such other local affections." Denver Chemical Manufacturing remained in the building until September 1919, when it sold it to R. U. Delapenha & Co., importers and representatives of the Seaboard Rice Company. 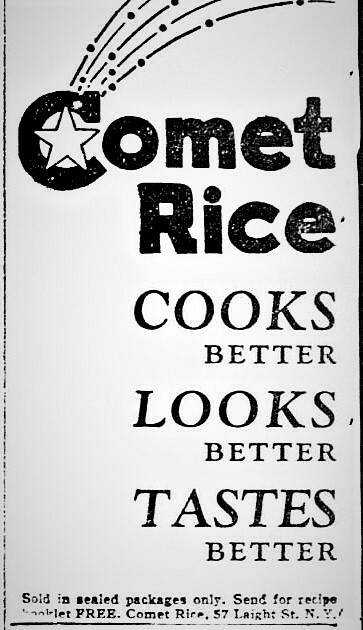 Their Comet Rice was advertised in newspapers nationwide. A clever marketing ploy was the free rice recipe booklet available to readers who wrote in. An advertisement pretending to be a news article appeared in newspapers on March 1, 1927. A seemingly serious headline in the Texas Breckenridge Daily American read "Debutantes Watch Diet." The "article" began "The whirl of social affairs taxes body and mind alike. But the younger set overcome fatigue by watching what they eat." What seemed at first to be a human interest story quickly became an apparent ad. 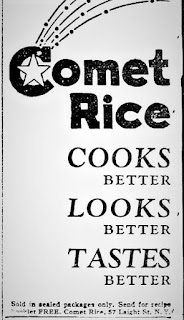 The following paragraph opened "Because Comet Rice is so uniform in size, it cooks into a savory heap of light, white, fluffy flakes." Among the directors of R. U Delapenha & Co. was Cecil E. Delapenha. The success of the firm afford him and his wife, Dela, to live lavishly on the sixth floor of the upscale Century Apartments on Central Park West. The couple had no children. On July 17, 1933 Cecil left his apartment as usual. Dela, who was 48 years old at the time, was suffering depression, termed by doctors as "melancholia" at the time. Shortly after her husband had left, she turned on the six gas jets of the kitchen range, the seated herself on a chair to await her death. She forgot, however, to extinguish a pilot light. Gas filled the room and it is unknown if Dela passed out from the fumes. When the gas exploded it blew out the apartment windows and those of the apartment directly above. The New York Times reported "The force of the explosion had hurled her to the floor." The blast alerted tenants and the superintendent, Frederick Moore, who entered the apartment with a passkey and extinguished the small fire that had resulted. Dela was dead. With the repeal of Prohibition, R. U. Delapenha & Co. added Myer's Rum to its offerings. It went back to a tried-and-true marketing strategy for its new product. An advertisement in Life magazine on November 30, 1942 noted "For new free Rum Recipe Book write R. U. Delapenha & Co."
The ad pictured two well dressed gentlemen in front of a roaring fire. "What better way to spend an idle evening hour than with good companionship, a good fire and a cheering drink made with Myer's--the dark Jamaica Rum?" In addition R. U. Delapenha & Co. manufactured its own product in Jersey City, described as "glazed pineapple and citron and crystallized ginger." After three decades in the Laight Street building, R. U. Delapenha & Co. sold it in 1951 to Pasquale Gauriglio. He operated his paper stock warehouse from here through the 1960s. By then the Tribeca district was seeing evidence of change once again. Discovered by artists, its lofts and stores were being converted to galleries, restaurants and living spaces. By 1972 the lower portion of No. 57 had been converted to an off-off-Broadway theater, The Trust, run by dancer and choreographer William Dunas. In May that year his "Our Lady of Late" was performed here. Don McDonaugh of The New York Times called it "murky dance both in content and lighting." The following year Robert Magginson & Associates performed here in "I Went With Him And She Came With Me." As was the case with so many 19th century Tribeca loft buildings, No. 57 Laight Street was converted to "loft dwellings" in 1986 with one residence per floor. Tucked away on the relatively quiet side street, the dignified structure is easily missed.